The longer we wait the more nervous I become. It’s maybe 10pm now and we’re told the shamans inside are now praying. They’ve come all the way from Colombia for this ceremony. At 11pm we all gather around the front door in dark silence. Listen to them sing and chant. Then those who have experienced Ayahuasca before go inside one by one. Peter whispers goodbye. Then the rest of the group goes inside. There’s maybe 15 new drinkers. On my turn I kneel in front of the shaman by the door. He pours a cup from a plastic bottle. His face is lit by candles. I take my cup and suddenly I forget what I am saying. I pray quickly then take the cup, drinking it all in at once. It’s unpleasant, strong, gritty like sand but it’s not terrible. The taste is strange and I need water. I sit by the fire and pray again and again. I feel strange, unwell so I walk around through the trees. The branches are like webs and the stars are poking through. The sky is clear. The moon is bright tonight. I start hearing other people retching, coughing. It makes me nervous. Try not to focus on that. I lie down in the teepee and behind my eyelids are small hallucinations. Spiralling. Swirling. Shapes like snakes. Outlines. Animals. Aztec like symbols I don’t understand. I feel the aya rising inside of me up to my chest. It’s time. I run out and purge. It’s clean. Clear. Easy like water. I feel a part of me vaulting towards the ground. I feel dizzy, nauseous, lie back down in the teepee. Is this all I need? Is it happening? Aya are you here? I’m afraid but I know that I need another cup. The shaman is at the door of the cabin smoking a cigarrette. I gesture for another cup and receive a small one. I feel really sick now. I try to sit by the fire but it makes it worse. Walking hurts. I hear people running to throw up by the trees and I feel terrified. Overwhelmed. I can’t take it. I go to the road and stare at the moon as though it’s looking back at me. Aya is that you? Mum? Help me please. Help me mum. I’m scared. Mum! I don’t know if I whisper or say it in my mind but I cry like a child under the moon. Shoulders heaving. The surrounding long grass and trees make me feel like I’m in Africa. I start to walk back to the teepee. I need to go inside. Now. Then the ground comes towards me and I realise I am falling into the dirt. Fainting in slow motion. I can’t get up. It hurts too much. I curl up crying. It’s agony. I’m trapped here, I’m going to die. Someone needs to come help me. Peter, the shamans, anyone. I am dying. I feel my insides wrestling, fighting, maybe I should throw up. 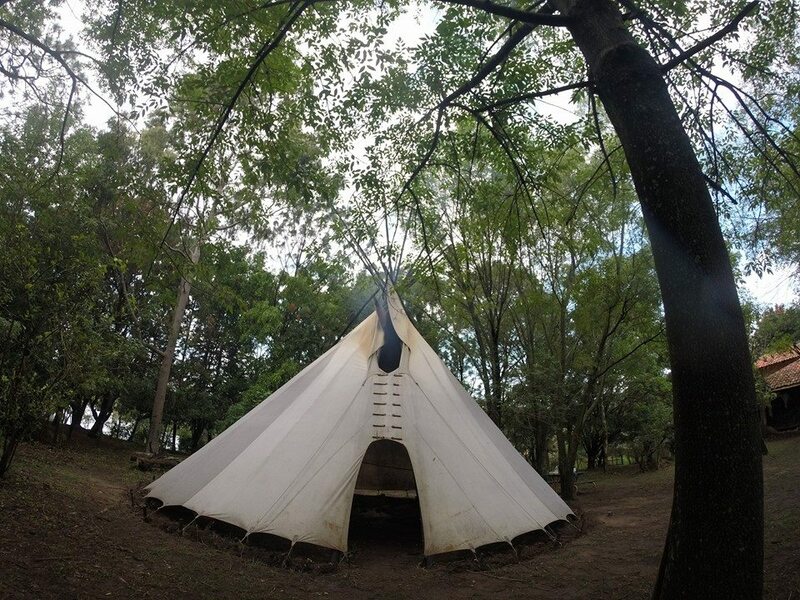 I think long and deep then force myself up to my bed in the teepee. It’s not far. Who cares if I throw up or pee on my blankets, I can’t be outside. I curl up crying, terrified, sobbing and I feel Peter’s hand grab my shoulder. Mommy where are you? I need you! Help me! I am screaming inside. I keep chanting my mantra. You are magic. You are beautiful. Know Aya and yourself. Slowly a calm starts to creep through my body. It stops shivering. I feel the presence of a man and a woman. Our mother and father of the earth. They smile and the mother steps forward. Hush, quiet my dear child I am here. You have nothing to worry about now. I’m with you. I am vaguely aware that I am smiling, my body isn’t moving. Come with me. Let’s go. We walk together. Though I don’t see it or where we’re going the feeling is so vivid as though it’s a movie in front of my eyes. I feel her holding my hand and we’re walking upwards. Always upwards. She tells me I did well. There is no need to be afraid. It’s all over now. You won’t be hurting now. It’s time to leave your body behind. It is just a body. It’s not you. And slowly I let go of my whole body. And it doesn’t hurt. I’m not afraid. I’m free. We float above my body now and see myself. See, it was easy. Don’t you realise that it is just the beginning. Only a small part. Then we leave the earth behind. I’m taking you home now sweet girl. Let’s go home. Yes, take me home. We fly up into whiteness, spiralling like snakes. Then we pass through what feels like a tunnel, tight and everything is racing through it. I feel myself in that tunnel of light with her. And we are light, the energy flowing through it. Don’t you see darling, you’ve always been here and you always will be. With me. You are as old as time. You are me and we are everything and everything is us. I ask her questions and she answers them. Sometimes I feel scared so she holds me. Soothes me. She tells me I’m beautiful, magical, silly, incredible. She tells me that we are all older than the earth. And she has always been with me. All of my irrationalities, fears, doubts are just silly distractions. They don’t mean anything. Your hunger, your body shivering, it’s meaningless now. It’s just a body. You always knew I was there, you were afraid. I was with you as a child, those times you took drugs and felt a voice that wasn’t your own. Don’t be afraid to find your voice. This is who you are right here. Now come, let’s go home. She keeps telling me, home. Don’t you want to see? She says. Yes. Yes. Occasionally I try to move my body into more comfortable positions, wriggling my legs and arms. I get nervous, I feel guilty. Don’t ever feel bad my child, do what you must. Brief flashes of fear pass. This isn’t real, I can’t feel my feet. Occasionally doubt and anger pass but Aya is calm. Don’t worry little girl, doubt me if you want, don’t be afraid. She picks me up and cradles me, strokes my head. And I feel safe again. I continue going upwards but then I feel Peter’s hand grab for mine. He is shaking and I feel the fear inside him. He’s on his own journey darling, I am with him too. You will meet him at the top too. But I feel afraid for him and don’t want to let go. I stroke his hand with my thumb and hold his arm, I move closer so he can hug me if he needs. Aya smiles at me. You have so much love inside darling. I am not mad. Help him, love him. Your road is easy. Others are not. His is not. I remember I wanted her guidance on him and how to love him. Beautiful girl, you love him completely. Don’t ever stop loving. You came to him to help him find me. He needed you. You are both teachers and he will find his way to the top. He can’t do it alone. He will bring wisdom and courage to others when he finds it. You guided him there and you always will. You will always be there for him. You are me and he is me. I feel as though Peter and I are the mother and father, abuelo and abuela, light, peyote and aya. I feel sick and afraid. Come child, you need to leave him with me. I am with him now. I hear others vomiting and feel scared. They are with me too darling, they will find their way. Come. Then slowly I leave Peter behind, still holding his hand. Occasionally I return to my body in an attempt to pass love to Peter. Beautiful girl, you have so much love. Don’t be afraid of it. This is love. Everything is. Now let’s go. We go flying upwards again. She often reminds me to forget my body. Forget the earth. This is your mind she says. All around us. We’re close to the top and my questions and answers become hazy and blur into eachother. This is it? All mind together here in this one flowing entity? Like a sky or cloud… a collective. The collective mind. All minds. Is this what all those books and religions and teachings talk about? Is this buddhist enlightenment? You read these things but now you can understand it. I ask questions like who was I in other lives and bodies but she tells me it’s not important. That’s not what I’m here for. Keep doing things in your body that make you happy. That connect you. Live and share and be a mother, in all senses. I feel as though my womb glows. You are a woman she tells me. You guide them to me. A vessel. After your body you come back to everything. You are everything. The sky, the ground, hear the music outside. You are the music. The notes of the flute vibrating into the air. Hear the shamans chanting. And feel a real deep amazement for them. They brought me to Aya. They know. Aya tells me that whenever I feel afraid, sad, lonely, mad, to remember that she is with me holding my hand. Questions like what am I doing with my life become unimportant. Be who you are. And I understand. She repeats it to me. Hear the storm building outside. She smiles. Lightning flashes through my eyelids. I laugh at how childish I was before. How I didn’t need to be afraid of anything. Parts of my life flash before me. My birth mother, father, their overwhelming love surges. Faces. Moments. Aya hugs and kisses me. I hear rain, I feel it on my feet and it sounds like it is raining everywhere but on my body. Aya tells me to ignore my surroundings. I hear people rushing inside the tent, nervous voices. There is crying and yelling. I feel fire growing and waning. I see it behind closed eyes. I feel Peter moving almost nervously, sitting up. I feel clear, unafraid, peaceful. I am surrounded by beauty. Earth is beautiful. Aya is Pachamama. The chaos gets louder. Aya says she is the storm. It’s nearly time. What time? I become afraid. Don’t leave me mother. Occasionally she doesn’t answer me and I feel my body shiver. I call for her. Don’t be scared, I’m still here. You are ready sweet girl. She cradles me in her arms. Soothing and kissing. I ask her not to leave. It’s time. Look at our family all together in this space. I open my eyes and see the group of people huddled by the fire within the teepee. I feel sickness rising. You can do it, she says. I will never leave you silly girl. I feel a ball of energy rising in my centre. Aya summons the energy and all women, all women that ever were or will be from the tunnel of time come together, summon all of their love to help me. I feel myself crying. They hold my hand. You can do it, Aya is calling. I see the faces of women, Indian women, old and young women. Then finally I purge again and it’s beautiful. Magic. I laugh. I did it! Aya crys, I am so proud of you my girl, you did it. See, wasn’t that easy. I love you so much. I feel love surround me. I cry from happiness. My mind is clear and I absorb my surroundings. Others are awake, some are still lying on the floor. I hear her voice. Proud. I did it. And it was the easiest thing I had ever done. I find Peter. Find Susy. There’s chaos and people racing to keep the fire up but I feel peaceful. The ground is soaked and so are our clothes and sleeping bags. The rain is coming from the sides and above. I’m cold but warm within. So much happiness I keep smiling. Aya still speaks to me every so often and I sit with my head on Peter’s shoulder watching the fire. A lady gives us three a blanket to keep dry and warm and we drift in and out of moments of sleep. Lauren attended a ceremony with me in Guadalajara and wrote an eloquent and beautiful account of the night. I will posting my account on Tuesday thanks everyone and especially thank you Lauren. lauren elizabeth Blog at WordPress.com.